Discovering Relations by Entity Search in Lightweight Semantic Text Graphs. In WIKT 2014 proceedings, 2014, pp. 18-21. ISBN 978-80-227-4267-2. In WIKT 2013 proceedings, 2013, p. 161-166. ISBN 978-80-8143-128-9. In CENTERIS - Conference on ENTERprise Information Systems, Berlin : Springer, 2010, part I, p. 209-218. ISBN 978-3-642-16401-9. ISSN 1865-0929. In TIR'10 workshop, In DEXA 2010 : Database and Expert Systems Applications: proceedings. - Los Alamitos : IEEE Computer Society, 2010, p. 27-31. ISBN 978-0-7695-4174-7. ISSN 1529-4188. Proceedings of the Poster and Demonstration Paper Track of the 1st Future Internet Symposium (FIS'08), CEUR-WS, ISSN 1613-0073, Vol-399, pages 33-35, 2008. In Proceedings of ICCS 2008; M. Bubak et al. (Eds. ): ICCS 2008, Part III, LNCS 5103, pp. 331-338, 2008. 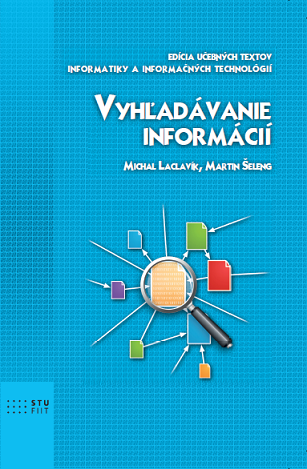 LACLAVIK, Michal - SELENG, Martin - HLUCHY, Ladislav. In INFORMATICS'2007 : proceedings of the ninth international conference on informatics. Bratislava : Slovak Society for Applied Cybernetics and Informatics, 2007. ISBN 978-80-969243-7-0, s. 113-116. LACLAVIK, Michal et al. 2007. Yet undiscovered potential of the e-mail communication.p. 45-50. Towards semantic enterprise vision. p. 66-70. Information Modelling and Knowledge Bases XVIII. IOS Press, Amsterdam, Marie Duzi, Hannu Jaakkola, Yasushi Kiyoki, Hannu Kangassalo (Eds. ), Frontiers in Artificial Intelligence and Applications, Vol. 154, February 2007, pp.311-315. ISBN 978-1-58603-710-9, ISSN 0922-6389. Laclavik, M., Babik, M., Balogh, Z., Hluchy, L.
In: Frontiers in Artificial Intelligence and Applications, Vol 141, 2006. Proc. of ECAI 2006 Conference, G.Brewka et al.(Eds. ), IOS Press, pp.727-728. ISBN 1-58603-642-4. ISSN 0922-6389. 29 August - 1 September 2006, Riva del Garda, Italy. In: Proc. of 9-th Intl. Conf. ISIM'06 "Information Systems Implementation and Modelling", Brno, April, MARQ Ostrava, 2006, pp. 185-192, ISBN 80-86840-19-0. LACLAVIK M., GATIAL E., BALOGH Z., HABALA O., NGUYEN G., HLUCHY L.
In: Proc. of eChallenges 2005 Conference, 19 - 21 October 2005, Ljubljana, Slovenia, Innovation and the Knowledge Economy, Volume 2, Part 1: Issues, Applications, Case Studies; Edited by Paul Cunnigham and Miriam Cunnigham; IOS Press, pp.261-268. ISSN 1574-1230, ISBN 1-58603-563-0. LACLAVIK M., BALOGH Z., NGUYEN G.T., GATIAL E., HLUCHY L.
Nguyen G.T., Dang T.T., Hluchy L., Laclavik M., Balogh Z. and Budinska I.